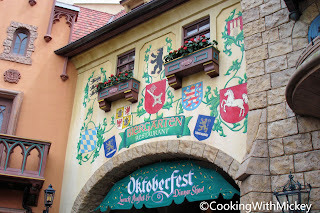 Biergarten in Epcot's Germany pavilion serves many traditional German dishes but one that many people will recognize as American is the macaroni salad. A perfect accompaniment to any picnic or summer party! Cook macaroni according to directions. Drain and cool macaroni. Mix all ingredients in a bowl and add to macaroni. Toss it well and adjust seasoning if necessary. Thank you SO MUCH for posting this! I LOVE this stuff. And with 1/4 cup of sugar its no wonder!